Hello! Debbie and I are going to be at the next Cheap Affair Event on Easter Sunday, Islington Mill, Salford. 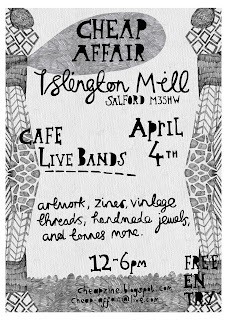 There is going to be lots of live music, food and I'm pretty sure some tasty Easter treats. Please pop by and say hello, we will have are usual crafty delights and possibly some treats aswell.